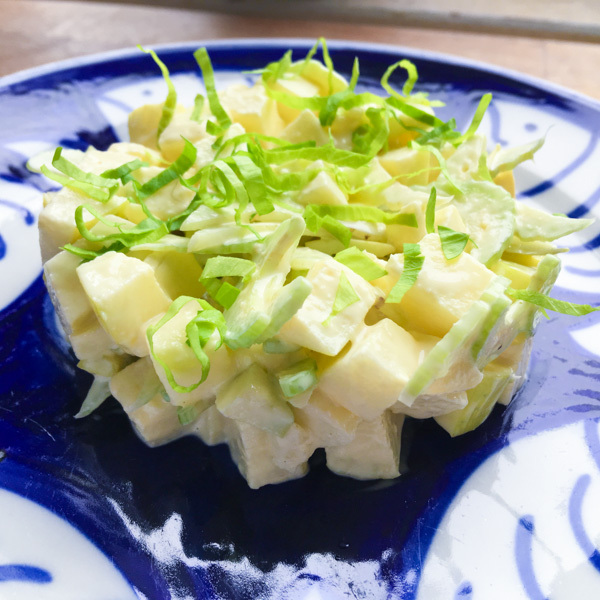 Waldorf Salad is an old salad, a fascinating salad, a salad common to my childhood, but why did I wake up yesterday and need to make it, to revisit it and the taste of Waldorf Salad as remembered from my childhood? 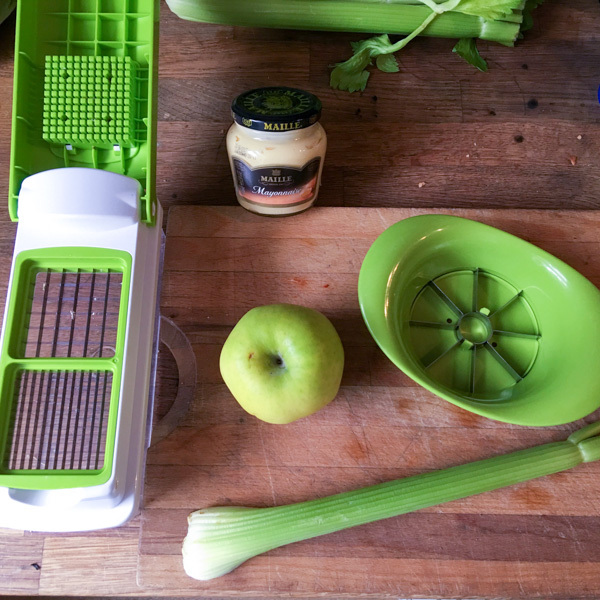 No-one would have guessed that by the end of the day, I would have immersed myself in the fascinating history of perhaps the most famous celery and apple salad in the western world? 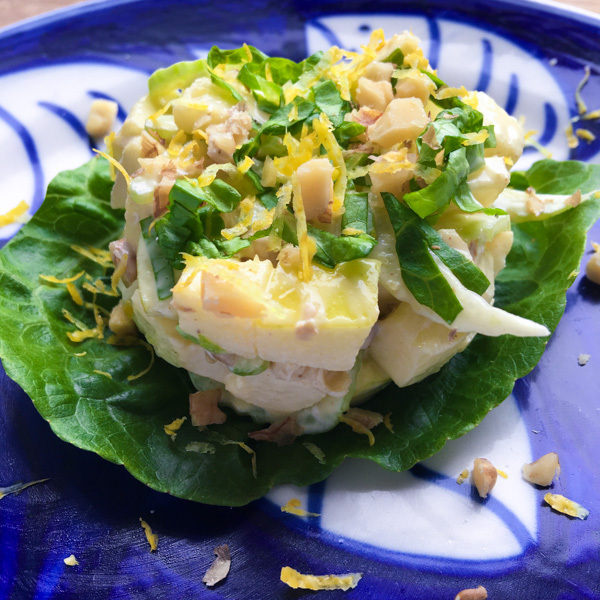 What we can see from this recipe is that over the intervening period of 3 years, this salad remained essentially a dish of apple & celery, dressed with mayonnaise. 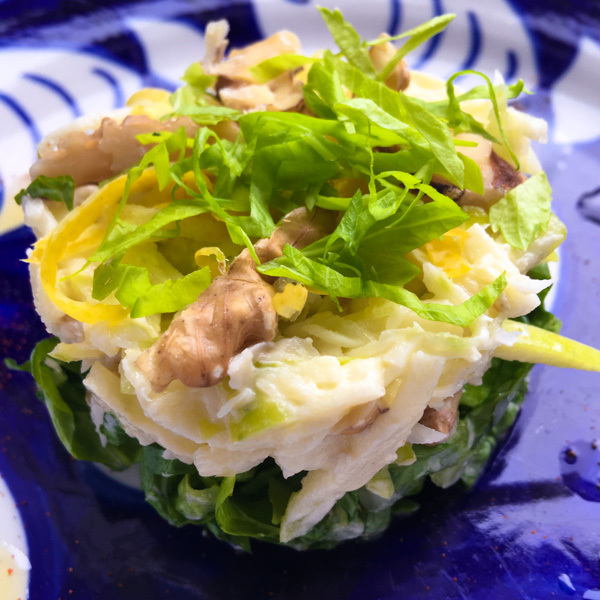 It is more than likely that this would have been presented in an elegant manner, but there is no mention in the book about garnishing (a fascinating read that fills in many of the blanks) this salad. By 1907, however it appears the salad had either undergone some modification and variation, or the principle garnish became part of the ingredient list. Either way, Escoffier, in his, “A guide to modern cookery” (1907, p.623) lists apple, celery root (celeriac), walnuts and mayonnaise. What’s interesting here is no ratio given for the walnuts and they are fresh, or soft walnuts with no skin. It is interesting to consider, in looking at this recipe as well, the question: Did Escoffier, the most famous chef of his day, presume to teach Tschirky how to make a balanced salad through publishing this recipe, or is he putting his own spin on it, as famous chefs are wont to do? 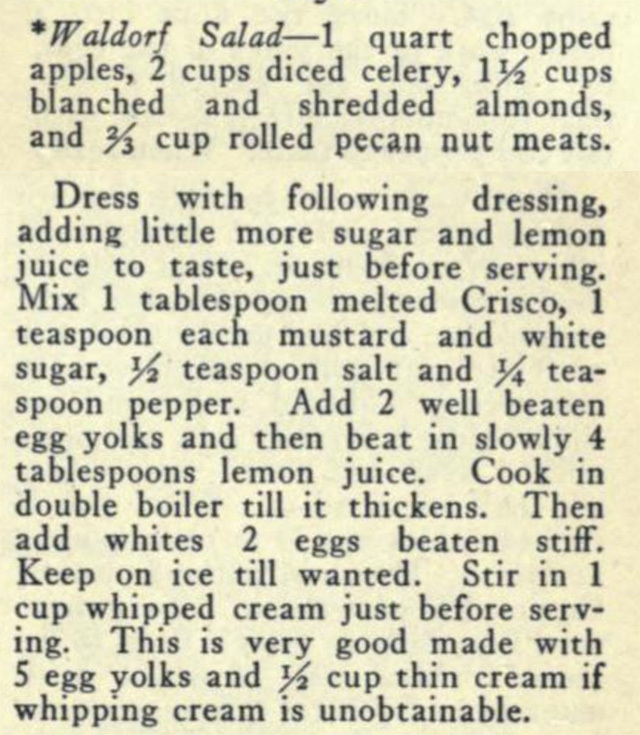 Next, we have mention of the salad, and how to garnish it, in the Boston Cooking-School Cookbook (1911, p339), by Fannie Merrit Farmer yet walnuts don’t feature in the suggestions. The next, “authoritative?” mention of the salad with walnuts, and commonly quoted on the web, is apparently in George Rector’s, “The Rector Cook Book” (1928) however, I can not find an actual online copy of the recipe. 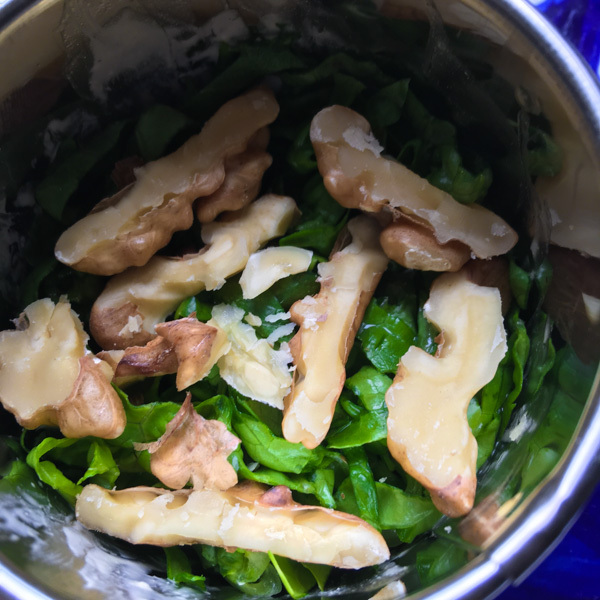 What is clear though is that nuts, in general, and walnuts more specifically, have been been an, on again, off again inclusion, but walnuts are now considered the traditional garnish ingredient, and indispensable component in this salad. 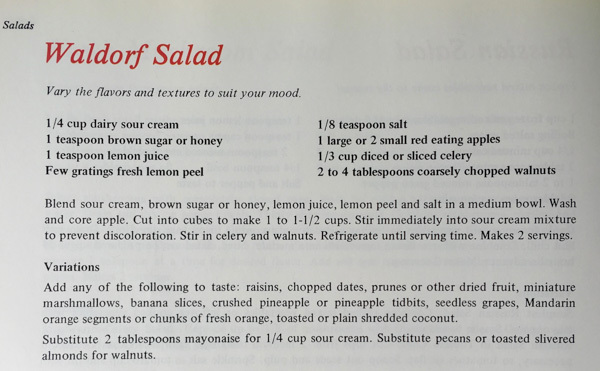 By 1977, the Waldorf Salad had become so tired that it was featured, perhaps as the poster child for the differences between British and American cuisine, in a Fawlty Towers sitcom. By this time, grapes had apparently become a ubiquitous and essential ingredient. which is somewhat reminiscent of Neil’s, including lemon juice, sour cream, salt and pepper as part of the recipe. In spite of the fact that Chefs of all sorts, and cookbook authors, have been putting their own stamp on the recipe, and ingredients, Robuchon’s, “Larousse Gastronomic” (2009, p1142) preserves the original recipe and simply states that walnuts were added sometime later, with no further attribution. It is clear from the history seen here so far, that there has been some common threads, and perhaps two schools of thought, guiding the development of variants of the Waldorf Salad, towards how we perceive it today. 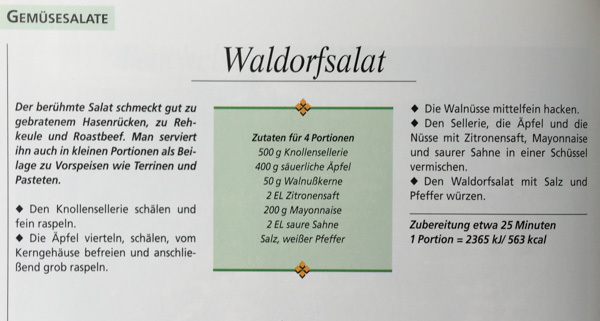 Now, the “taste” of Waldorf Salad, well of the salad that I remember from the 70’s and 80’s, or if you prefer, of late last century, was pretty much the lemon and sugar, mayonnaise, walnuts, apples and celery version. but I don’t really recall it so clearly anymore, so I guess I’ll just have to eat my way through salad history and see. 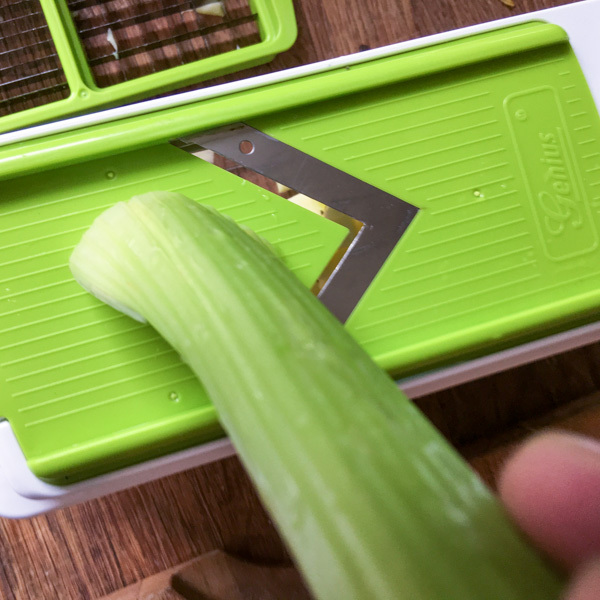 Some mayo, a green apple, a rib of celery and that’s it. 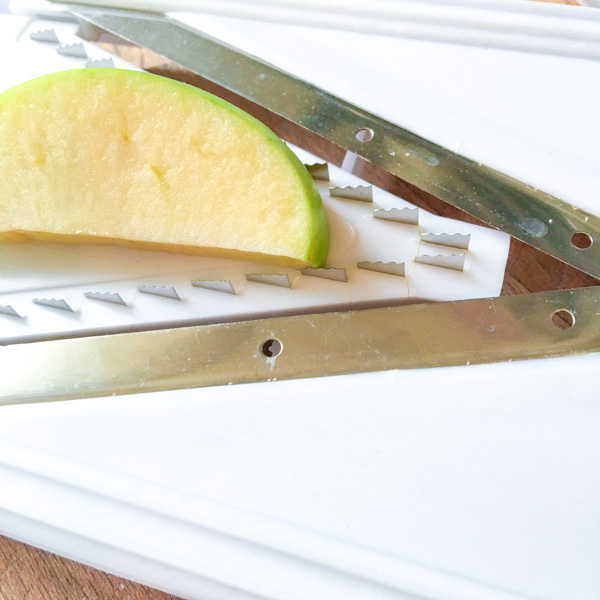 The apple corer/wedge-slicer is a wonderful bit of kit, easy to use and you don’t need superior knife skills. Works equally as well on cucumbers. 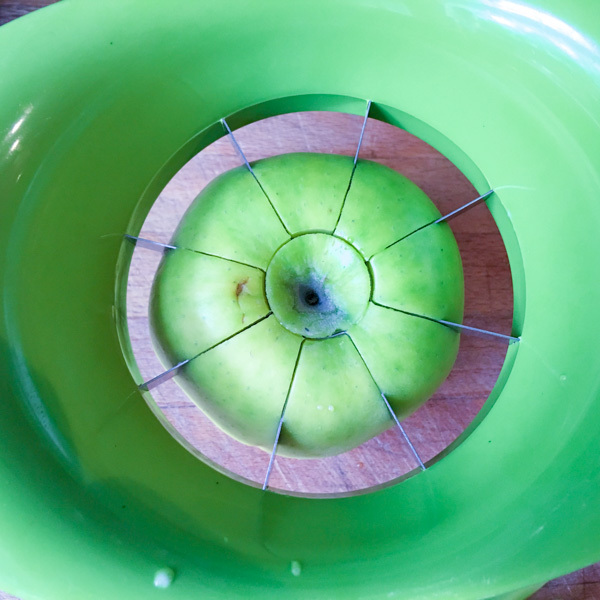 wedge and core the apple, then slice the apple wedges in half lengthwise. 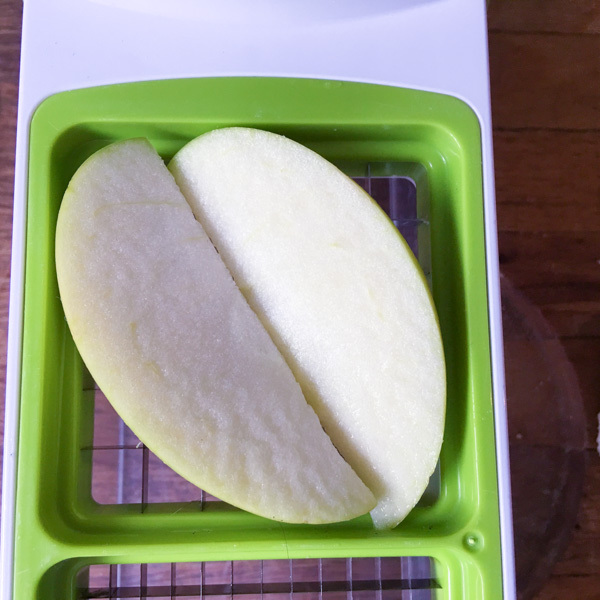 make sure there are no seeds in the apple slices. Plate up in any manner you wish, I used a ring mould and garnished with some chopped celery leaves for a bit of colour. 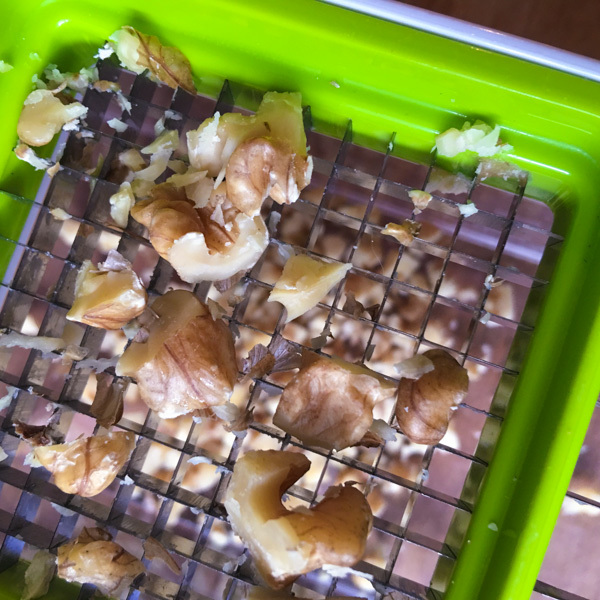 use the fine dicer on the Nicer Dicer Plus to chop the walnuts, its quicker and more uniform than with a knife. 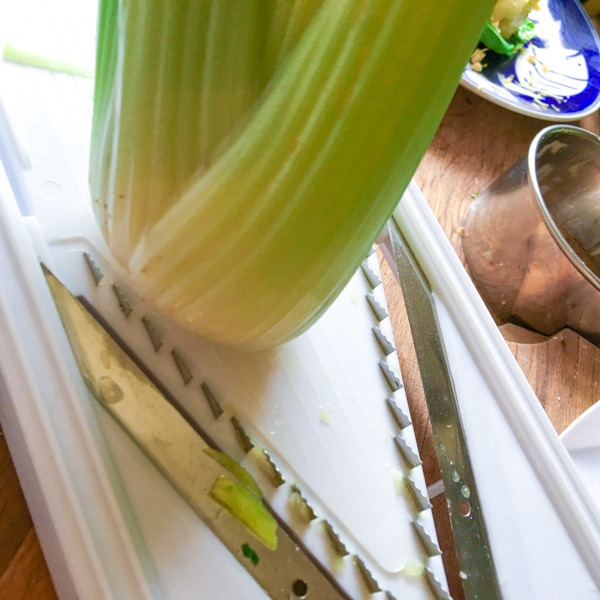 These days people are looking for ways to make their salads much lighter, and more fat free. This often involves, using low fat mayonnaise, mayonnaise made from so-called “healthy oils,” or by cutting the mayonnaise with sour cream, lemon juice, water, milk, yoghurt, or even substituting with a yoghurt dressing for the mayonnaise altogether. 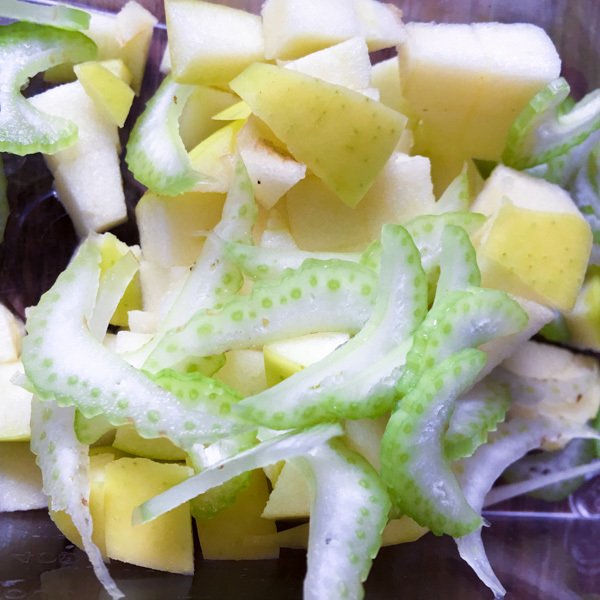 Other ways of shifting it up is to change the way in which the salad is presented, using other celery components and lettuce substitutes and garnishing with various other fruits such as grapes, dates, raisins, etc. 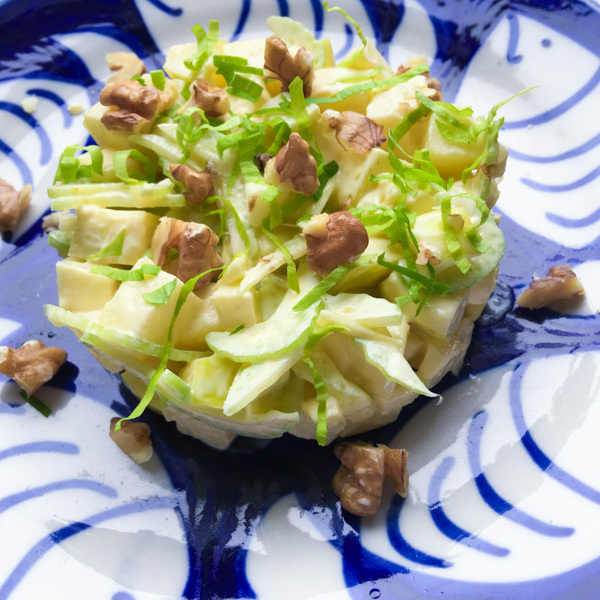 and there you have my take on a gently dressed, easy to chew, flavourful and well textured, crisp and light, contemporary Waldorf Salad, that is true to both the original, and the tradition, elements of the dish.